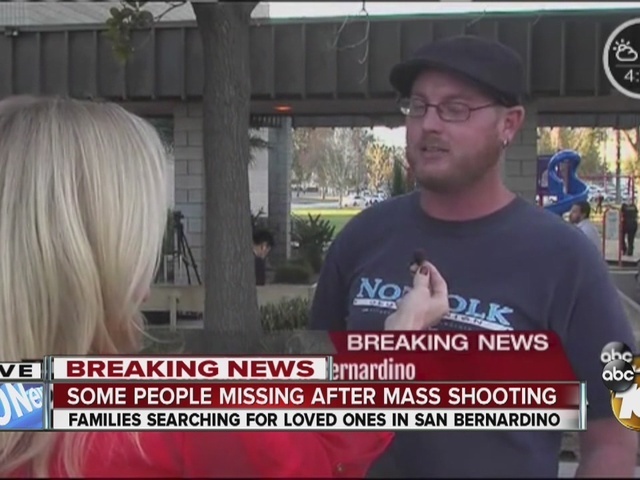 SAN DIEGO -- We met Ryan Reyes mid-afternoon at the Hernandez Center in San Bernardino where hundreds of people who survived the shooting were being reunited with their families. Reyes was patiently waiting outside, looking for his boyfriend who works in the building that was targeted. “He was in the conference center, yes, but I don't know if he was actually in the building when it happened or he was outside,” Reyes said. Bus after bus dropped off people, clearly rattled and upset. 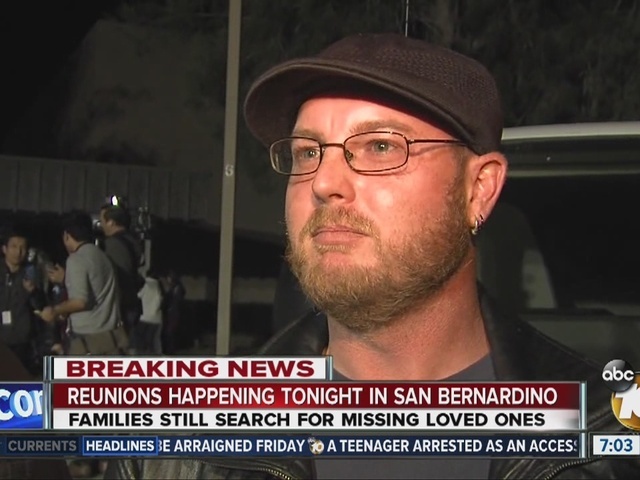 There were hugs and tears as they reunited with their families, grateful they are alive. Hours later, we caught up with Reyes again, still at the evacuation center. Reyes told us he saw a post on Facebook that said his boyfriend was shot, but OK. Dozens of reporters swarmed Reyes, who was more than happy to share the news that his loved one was alive. “I’m relieved to know that he's at least OK, but at the same time I’m obviously distraught to know that he's shot. Reyes headed to Loma Linda Medical Center where he believed his boyfriend is recovering. We followed not too far behind. When we arrived, we call Reyes, who told us his boyfriend was not at that hospital. He says he has checked with all the area hospitals and he is not at any of them. Reyes said he was heading back to the evacuation center. We head back to the center as well. At the center we ran into other family members of Reyes’ boyfriend. They were crying. “It doesn’t look good,” a woman said through tears as she walked away. We didn't see Reyes and he didn't answer his phone. We received a message that they will not know anything more until Thursday.